I should have gotten up an hour and a half ago, a long day looms but Maud who sleeps under the duvet during the winter had come up for air and put her paws around my neck. Couldn’t exactly break that snuggle so I have to just do things double quick, skip breakfast, don’t skip coffee (obviously) and shower in say 2 minutes! I can feel Spring I can almost smell spring and cannot cannot wait for it to arrive. My head is full of plans for the house and garden. I’ve started to work on the scheme for the school (in my head at least) and for the garden lots and lots of under planting will be commencing this year. Yesterday from the flower market I brought tubs of muscari their scent transporting me to a sunny place, and plopped them on the central island and in tubs outside.Â I planned in my head the veggiesÂ I will be growing, toms, courgettes, French beans, broad beans, aubergines could go on but won’t bore you, and toyed with the idea of buying an outdoor bread oven. Jamie Oliver’s is so cool and I have just the spot – except other things need to get done first.Â Patience, patienceÂ something IÂ do not have. My point this morning, which considering I am very late I should have made 3 sentences ago, is all to do with dining rooms. Funny one dining rooms if they are the posh type (i.e. you only entertain in them occasionally) often times they feel a tad formulaic. If they areÂ part of an open plan scheme, such as mine then its quite a fine line getting them to look comfy yet stylish enough to entertain the Jones’s in . Chairs dear friends are the key. 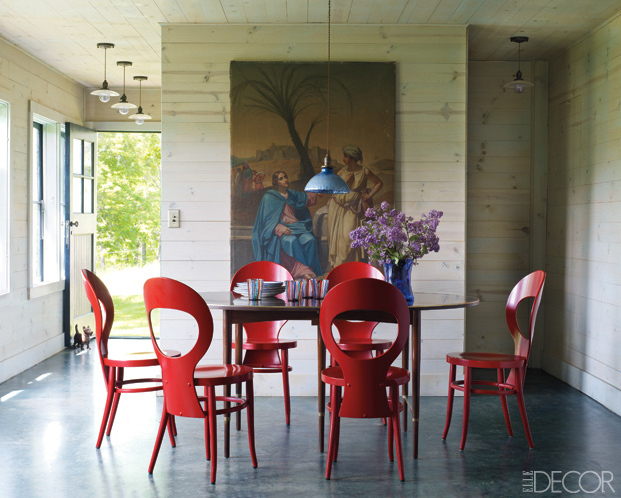 I have the biggest trouble on earth finding dining chairs – which is why I often prefer vintage to new ones. The ones below knock everything else out of the park,Â 50’s and French need I say more!Â If you want to turn an ordinary room into an extraordinary room add colourful chairs simple as that.